Angl Hii posing with her trophy after winning the Ladies crown at the Champion of Champions tournament at Sultan Abdul Aziz Shah Golf Club in Shah Alam in August. 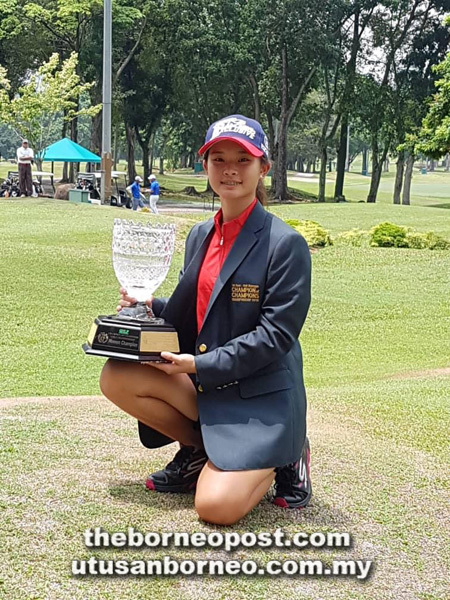 KUCHING: Junior golf star Angel Hii will be defending her Ladies Club Championship crown at the Kelab Golf Sarawak (KGS) Club Championship at KGS this weekend. Having won the title for two consecutive years in 2016 and 2017, the 14-year old Tunku Putra International School student will be looking to cap a hat-trick of wins. “This will be a warming-up event for Angel in the preparation for the World Junior Championship in Thailand next week,” said her father Albert Hii. Also expecting to defend their titles are Daniel Yeo Thian Chai in the Men’s Open Championship and Abdul Aziz Sahari in the Senior Club Championship categories over the two days of golf at Siol/Demak Nines on Saturday and Matang/Santubong Nines on Sunday. Three-time winner Lee Kah Ming (2013, 2015, 2016) and two -time winner Mohamad Lokman Mustaffa (2012, 2014) as well as 2011 champions Bernett Ling Soon Kiong are also expected to pose a strong challenge in the Men’s Open. Champions of the three main categories will each receive the challenge trophy, champion’s trophy, a goods voucher as well as a one-year allocated parking lot at the club.